I'm nearly at the end of my Dervla Murphy odyssey. I almost feel sad - one wishes for brilliant writers to write hundreds of books instead of merely a handful. On the other hand, if quality were to be compromised for the sake of quantity... Nah, it's probably best as it is. Today we'll talk Eight Feet In The Andes. 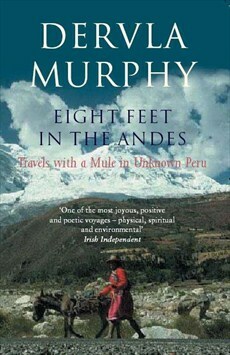 First published in 1983, it is the story of the Murphies' 1,200 mile trek through the Peruvian puna (grassy highland). Plural form is intended, as on this trip Dervla was once again accompanied by her small daughter, whose tenth birthday was celebrated on the road. A characterful mula (female mule), Juana, completed the company ('eight feet' - get it? ), carrying the ladies' gear. The book has everything that one might expect from a Dervla Murphy travelogue: colourful encounters with the locals, snapshots of glorious landscapes and exotic wildlife plus a fair share of adventures, all generously seasoned with the author's refreshing honesty. Add a few rants about Western civilisation (spot-on, as always) and a handful of historical references from the times of conquistadors and the picture is pretty much complete. Some would probably say that travelling 'a la Murphy' is too insane to contemplate. We are so used to modern comforts that few of us would dare to forgo them for weeks or even months (a disability of sorts, I'm sorry to say). However, Dervla's joy on being on the move and far from civilisation is so obvious, so CONTAGIOUS, that I started to itch for a rucksack and a good pair of walking shoes. No, I'm not likely to book my tickets to Peru just yet (I only wish I could...), but perhaps a short trek through Connemara? Money-hungry Ireland does not encourage camping wild these days (you wouldn't believe the frequency of NO CAMPING signs), but it's healthy to break some rules now and again.